But the other day I also realised I have a guilty pleasure when it comes to quilting. And that are jelly roles ! Yes you heard right, jelly roles. I used to hate them and still do when I unroll the thing and it makes a blooming mess everywhere. But they do satisfy a need for simple quilting in me and in particular when I just finished a big and complex project. I love strip quilts as you probably know by now and a jelly role fulfills just that love in a quick and sort of dirty way. You just unroll, place the strips in a pleasing manner and start sewing... 2 hours later you have a quilt top ! Tell me do you have quilting related guilty pleasures ? 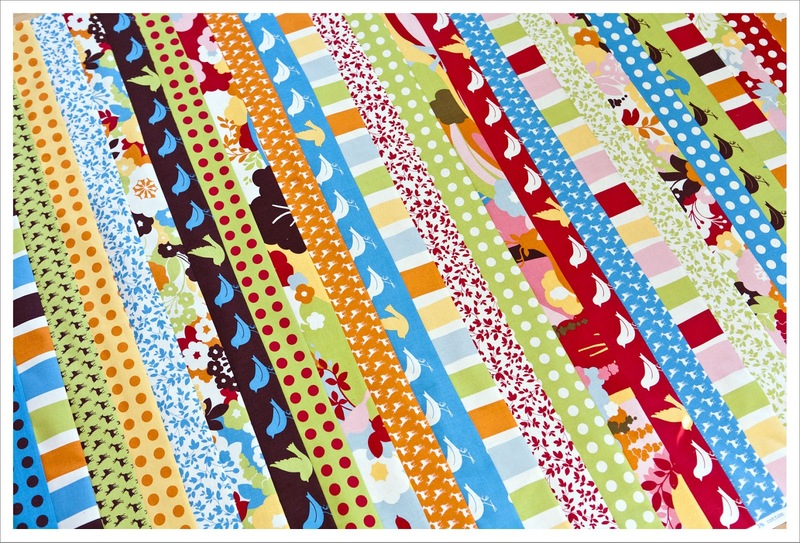 This here is a strip quilt from the new Momo for Moda collection 'Oh Deer' that I purchased some weeks ago. This quilt top has been finished a few weeks ago but because I was working on this super secret project for the past 10 days I didn't have time to share it with you. That is also the reason why I did not blog much either. I thought I'd rather not bore you with randomness and come back if I have to show something. The secret project will be revealed towards the end of next week but I can 't help put hint that it involves a rather prestigious well known British Fabric House. I can't wait to spend some quality time with this quilt top tomorrow and am still quivering with excitement about the secret project! I, for one, am clutching at straws and awaiting a fabulous Liberty project from you!!??!!! I am going to be eating chocolate, sewing hexies and watching Eastenders this evening - guilty as charged!